Good conditions and a new toy to play with has resulted in a lack of time to write about them. 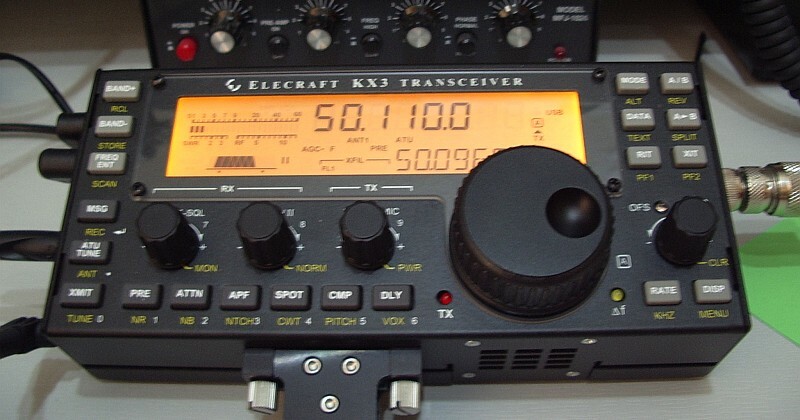 Since my last post I have spent a lot of time getting to know the Elecraft KX3. For those of you on the waiting list all I can say is: it's worth the wait. If you aren't, then what are you waiting for? The KX3 really is the ultimate portable rig. It knocks the FT-817 into a cocked hat. It looks and feels like a baby K3. The only reservation I would have about its adoption by diehard SOTA enthusiasts who go out in all weathers is that it is rather an expensive radio to subject to the worst of the British climate. But as a fair weather walker I would have no such reservations. In fact I have already got a plastic toolbox with a foam insert into which I will soon be making a KX3-sized hole! If you are a K3 owner then the KX3's similarity to its parent means you will know what to expect. But there are also things where familiarity to the K3 is not an advantage, where functions are not in the same place. The KX3's front panel is a little bit shorter and quite a lot less wide, but the same number of functions have been crammed into it. All the buttons have dual functions depending on whether they are pressed or long-pressed. The radio is powered on and off by pressing two buttons at once. Some of the knobs have three functions depending on whether you press them first or long-press the button below. If it sounds complicated then it really isn't and you'll quickly get the hang of it. The only thing I can't understand is the decision to make AGC Slow/Fast/Off an option on the configuration menu. The AGC button on my K3 gets a fair bit of use, mainly to turn AGC off when operating PSK with a wide bandwidth. But I don't plan on using the KX3 for data modes much so this isn't an issue I'm particularly bothered with. The KX3 designers have made a few unusual choices of interface sockets, notably a 4-pole 3.5mm jack for the microphone. These jacks are a bit hard to obtain but don't worry: you probably won't need to. Four poles are only needed to support the up/down buttons of the Elecraft MH3 mic. You can actually plug a computer headset with its two 3-pole 3.5mm jacks into the phones and mic sockets (RF immunity not guaranteed.) You won't have a PTT but you can use VOX instead or the XMIT button on the front panel. Ideal for windy hilltops (is there any other sort? Some SOTA operators may be put off by the lack of 2m coverage. Elecraft has promised 2m will be available as an option, as it is for the K3. Hopefully it will perform better than the ubiquitous hand-helds and even the FT-817 when subjected to the large out of band signals experienced on British hilltops. What many people will want to know is: what is the receiver performance like? "Better than an FT-817" But that would surprise no-one and in any case is only an educated guess. I don't have the antennas or QTH to subject the KX3 to challenging input levels. All I can say is that the KX3 receiver is quiet and delivers clear and open-sounding audio. Just like a K3, in fact. Very interesting, Julian and pleased to see your rig on 50MHz! The receivers sound just the same, but if you are critical then the KX3 is not as good as the K3. The filters aren't as sharp and close-in loud stations do bleed over or pump the AGC. I think the KX3 is great for what it was designed for which is a transceiver to be used in the field. I think some people may be buying them as a "poor man's K3" for use in the shack as the main ststion. If so I think they might be a bit disappointed.